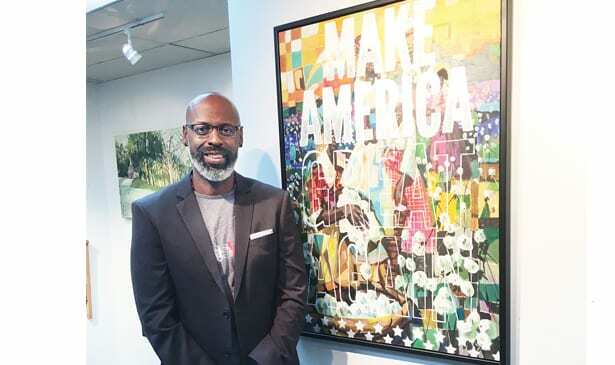 Artist Charly Palmer standing next to the art piece Make America Great Again. 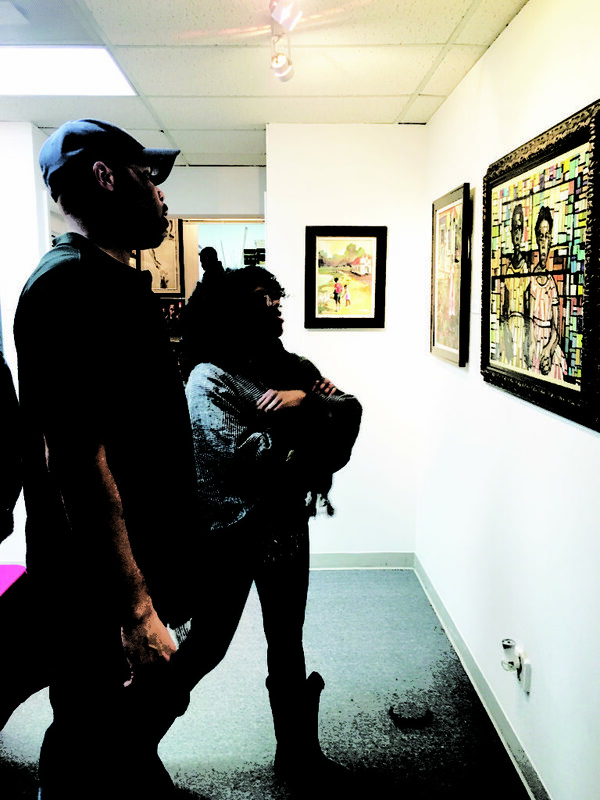 A 20-year friendship and a small conversation led one man to showcase his art at Woodcuts Gallery on Oct. 28 for those who want to see the existence of African Americans in America. 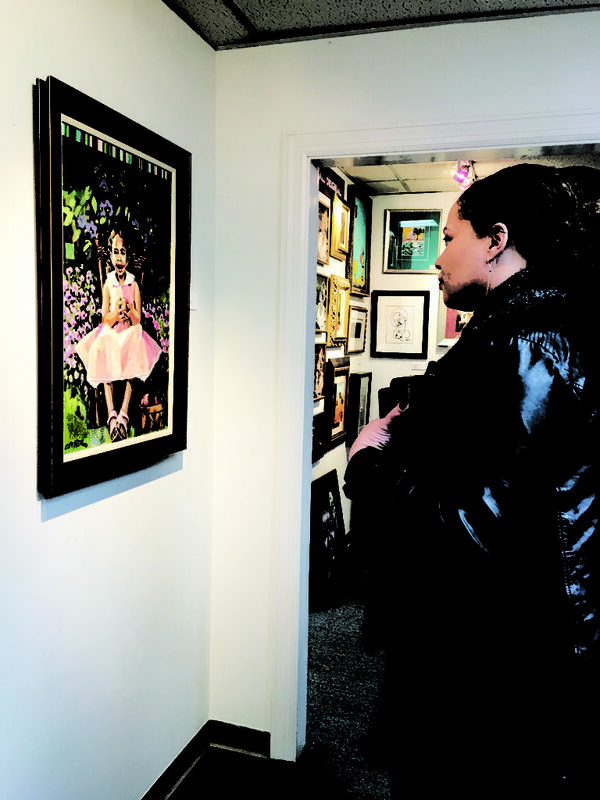 Every month, Woodcuts Gallery and Framing located on Jefferson Street, showcases the artwork of various artists in an art crawl. Artists that have showcased their work include James Threalkill and XPayne. Palmer’s style of artwork not only shows what has happened in the past, but also what goes on today. One of Palmer’s art pieces is located in the Carl Van Vechten Gallery on the campus of Fisk University. Palmer was selected to execute artwork commemorating Fisk University’s 150th year anniversary. While many spectators came to see the artwork and the history behind it, Stephanie Leon was simply looking for activities around Nashville. Leon loved the fact that some paintings made her think outside of what the painting was intending. She also loved the variety of the paintings shown. “I like the contrast of colors,” said Leon. Terry Willis, another spectator did not have a favorite piece of artwork, but did enjoy the significance of Palmer’s paintings. 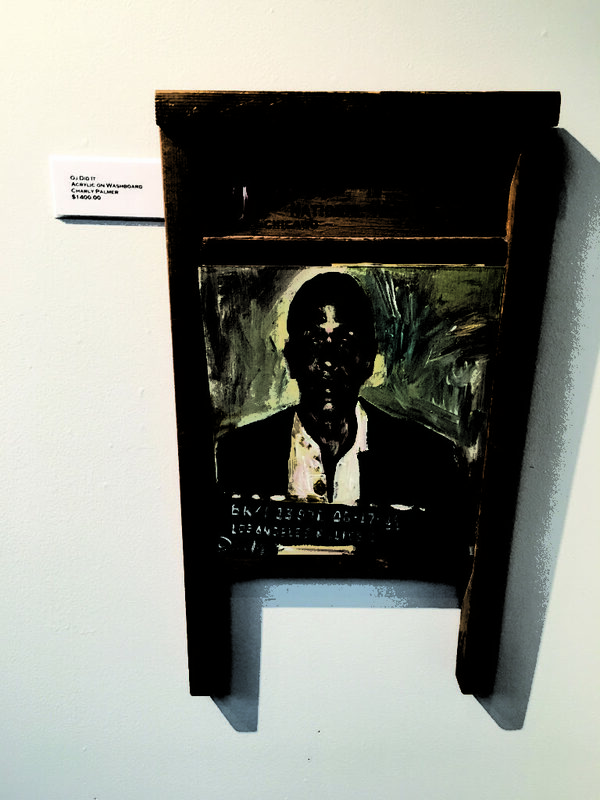 One piece of artwork titled “Justice is Blind” moved Willis. “My mind runs when I see the painting and what is signifies. Its talking about issues in the community,” said Willis. Palmer used various canvases and even a washboard to show off his pieces. The type of paint that he uses in the majority of his paintings gives him the results he wants. “I work with acrylic because it’s similar to oil. What I like about it is that if you water them down you get a water color effect,” said Palmer. Palmer uses acrylic because if he makes a mistake, he can wait for the paint to dry and can paint over it. The owner of Woodcuts Gallery and Framing, Nathaniel Harris, has known Palmer for almost two decades and was looking forward to Palmer showing his artwork in the gallery. “I met him at one of the Atlanta art festivals years ago.” said Harris. Palmer’s artwork brought in a small crowd, but the impact it had on those present made a difference. Artwork by Charly Palmer titled OJ Did It. Alvin and Kristen Hentrel looking at artwork painted by Charly Palmer. 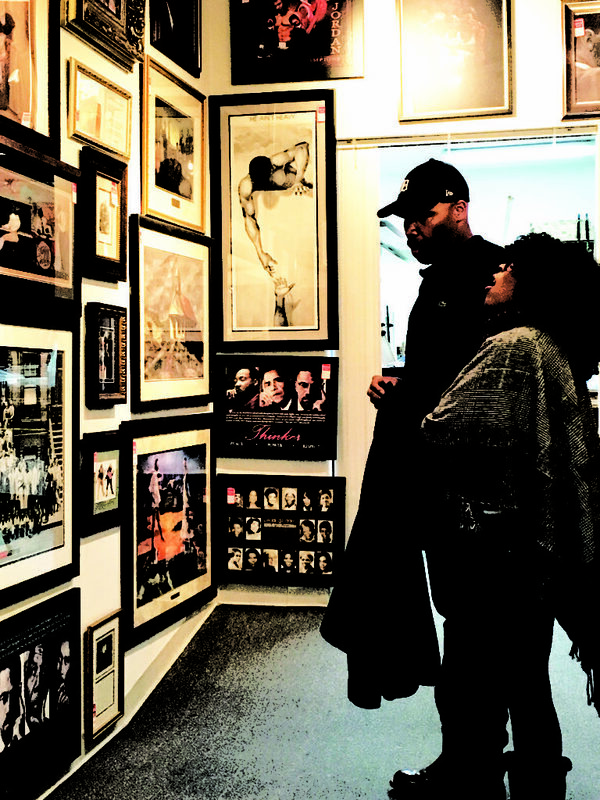 Alvin and Kristen Hentrel looking at various art work in the Woodcuts Gallery and Framing shop.